Upon arrival in Delhi International Airport you are met by our Executive and transferred to Delhi Domestic Airport to board Flight for Srinagar.Upon arrival in Srinagar Airport you are met and transferred to your pre booked Houseboat. Overnight stay at the Houseboat in Srinagar. Morning Half-day tour of world famous Mughal Gardens visiting the Nishat Bagh (The garden of pleasure) and Shalimar Bagh (Abode of love).In the afternoon Shikara ride on The Dal Lake to enjoy the beauty that God has graced this city with which is often compared to Venice. You will get a view of some very interesting places around the Lake. Morning visit to the Shankaracharya Temple – situated on the hill known as Takht-e-Suleiman. It is believed that the great philosopher Shankaracharya is supposed to have stayed here when he visited Kashmir to revive Sanatan Dharma.Later explore the local markets of Srinagar. After breakfast leave by Private Vehicle for Gulmarg also known as Meadow of Flowers, is one of the most beautiful summer resort in the Valley. It is also popular for its golf course (in summer), the highest in the world and skiing during the winter season. Enjoy the splendour of nature and the snowy mountains. One can have Gondola ride (cable car) from Gulmarg to Khalinmarg. Upon arrival in Gulmarg check in at your pre booked Hotel. Overnight stay at the Hotel in Gulmarg. Today enjoy the immense beauty and adventure activities of the Gulmarg, the hill resort with magical meadows and mountains. After breakfast leave by Private Vehicle for Pahalgam 2440 Mtrs (Vale of Kashmir) on the way visit Saffron fields and Avantipur ruins which is eleven hundred years old temple. Upon arrival in Pahalgam check in at your pre booked Hotel.After lunch enjoy the nature’s charm of the valley. 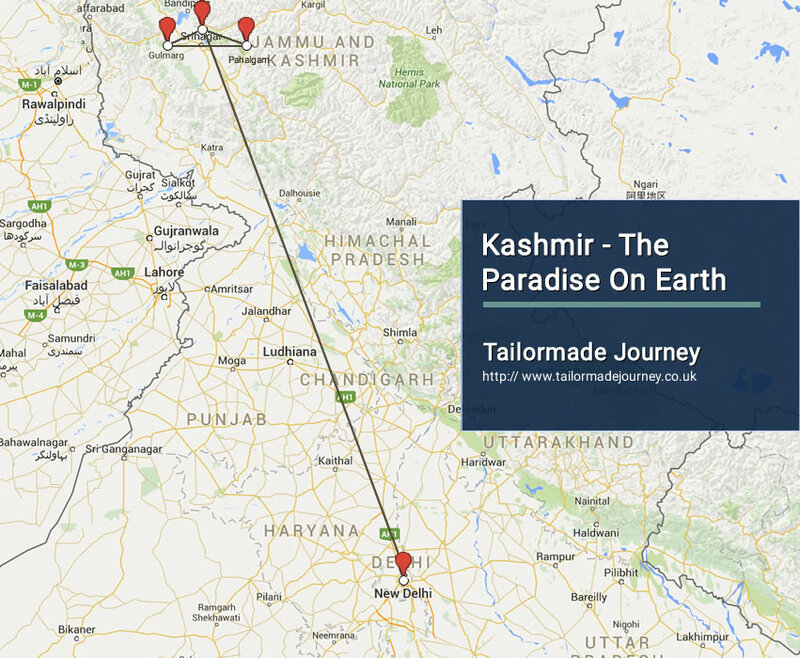 Overnight stay at the Hotel in Pahalgam. Today enjoy the beauty of the Pahalgam Valley amidst lofty deodars, fir, pine, junipers and many other conifers. It offers wonderful treks, skiing, mountaineering and camping sites. Pahalgam is an angler’s paradise. Srinagar – Delhi (By Flight).Today you leave by Private Vehicle for Srinagar. Upon arrival in Srinagar you are transferred to Srinagar Airport to board Flight for Delhi. Upon arrival in Delhi Airport you are met by our Representative and transferred to your pre booked Hotel.